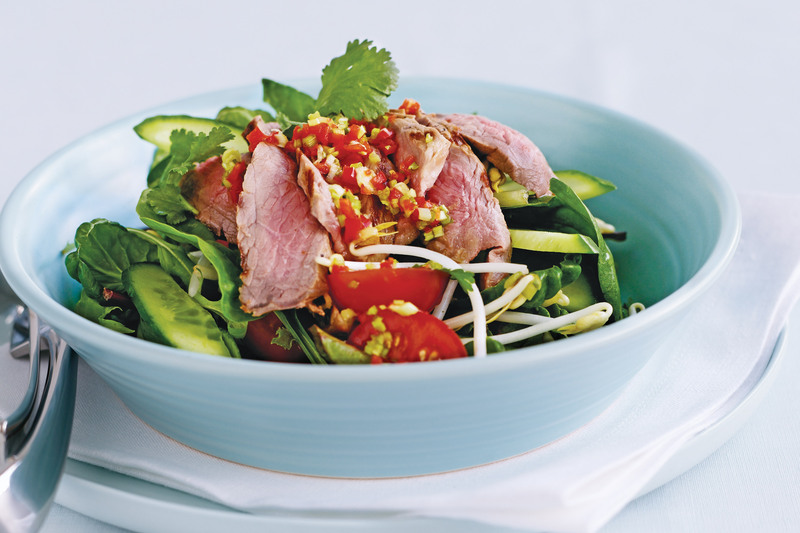 This spicy, super healthy warm beef salad is packed with protein and bursting with flavours. The perfect way to kick off the working week! Preheat a chargrill on high. Rub both sides of beef evenly with oil and season with salt and pepper. Add the beef to the grill and cook for 2-3 minutes each side for medium or until cooked to your liking. Transfer to a plate and cover with foil. Set aside for 5 minutes to rest. Thinly slice across the grain. Meanwhile, to make the dressing, place the chilli, coriander root, vinegar, lime juice and sugar in a small bowl and stir until the sugar dissolves. Combine the Asian greens, tomato, cucumber, bean sprouts and coriander leaves in a large serving bowl. Top with beef and drizzle over the dressing. Serve with bread, if desired.